Valencia Summit homes are located with easy access to the Interstate 5 freeway, College of the Canyons, and California Institute of the Arts. 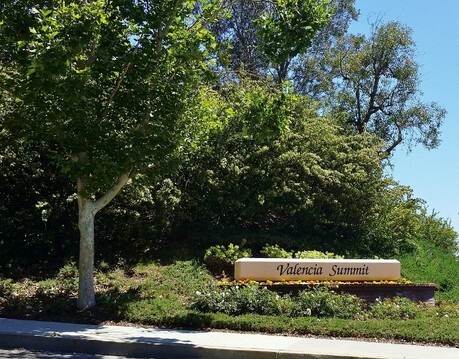 The beautiful Summit homes, located in the master planned community of Valencia in the Santa Clarita Valley, surround over 40 acres of oak studded park lands with inviting walking trails. Many of the homes have beautiful views of the Summit Park, and of the Santa Clarita Valley hills. The Valencia Summit amenities includes beautifully landscaped walking trails called paseos, a large community clubhouse, community swimming pools, spa, sports courts, and tennis courts. The tree lined streets, the combination of hilly and flat streets, the lovely greenbelt areas make this a very pleasant neighborhood for walking! Walking on the Summit trails feels like you're a thousand miles away! On an early morning walk you can spot rabbits and squirrels scampering under the brush. Hear the crunch of tree pods under foot. Smell the woodsy tree bark. The photo above is taken at one of the entrances to the Summit trail. As you might suspect by the name, many of the homes in the Summit have beautiful views of the Santa Clarita Valley! Valencia Summit Home Neighborhoods include: the single family homes of Windemere, Chelsea, San Marino, and the townhomes of the Stratford Collection overlooking the Summit arroyo. The Chelsea homes (as seen in the photo to the right) offer a French flair with several stunning floorplans, with spacious living areas, up to approximately 2800 square feet. The San Marino homes are Mediterranean styled homes with red tile roofs; they feature patio areas which invite you to enjoy a relaxing morning or evening enjoying the warm weather or cool gentle breezes. Many of these patios are interior patios seen from several rooms of the home. 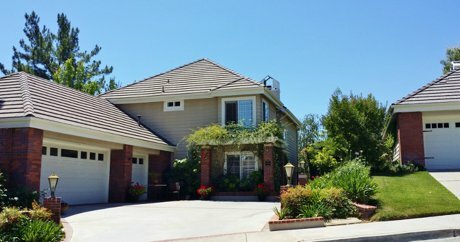 The Windemere homes (as seen in the photo to the left) are the largest floorplans, with one and two story plans, some with front gated patios; they have an English style theme, and some have turrets. Many homes feature custom leaded glass windows, and the pretty landscaping of many of these homes makes you think you are in an English countryside. The proximity of the Summit Park trees and landscaping provides a very private backyard feel, or amazing views of the Santa Clarita Valley. The Stratford Collection are the only townhomes in The Summit. They are elegant homes within a gated community with views of the Summit arroyo and views of the Santa Clarita Valley, and located near the Summit clubhouse, which can be used for events by the homeowners of the Summit. There are four different floorplans in the Stratford Collection: The Carlton, with two master bedrooms, approximately 1600 square feet; The Ashburton, having over 1950 square feet and three bedrooms; The Hathaway, with over 2000 square feet and three bedrooms; and The Chadwick, over 2100 square feet with three bedrooms, 3 baths, and either a 2 or 3 car attached garage.